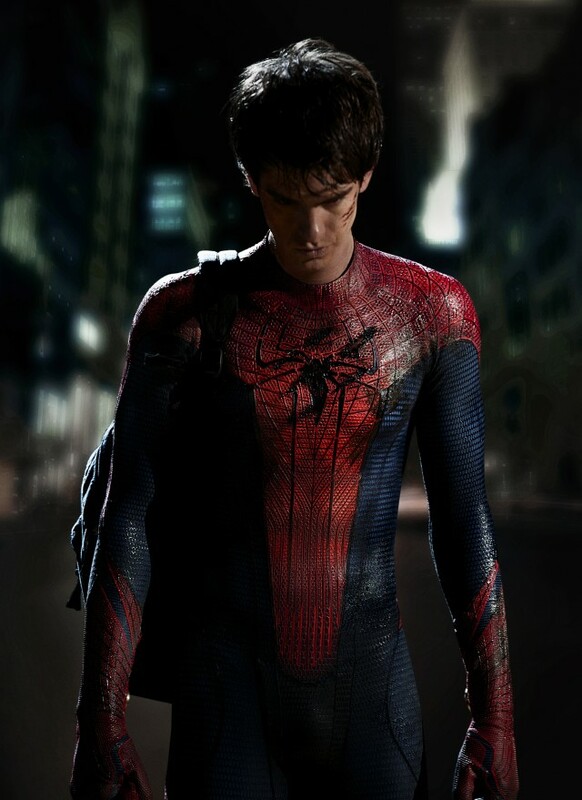 First official photo of Andrew Garfield as Spider-Man! The first official photo of Andrew Garfield as Peter Parker in (most of) his Spider-Man costume! Click it to open a massive 4.4 MB version that has tons of detail. This was all over the Internet today, but I grabbed it from Badass Digest because they went the extra mile with some fancy detective work. In this follow-up post, they zoom in on what appear to be metallic nodes on the insides of the costume’s wrists. I like this for lots of reasons. As you know, Spider-Man used mechanical web-shooters in the comics (and in the 1970s TV series, where he only wore one on the outside of his right glove). The Sam Raimi movies gave Tobey Maguire’s Peter Parker “organic” web-shooters that became part of his anatomy after he was bitten by the radioactive spider. While this change went a long way toward making Peter feel even more like a freak, it also robbed us of an opportunity to see Peter Parker the Science Whiz in action. And that’s one of the things I hope to see in the new series of films with Garfield as Peter. So I’m really excited about this. One thing that’s a bit confusing is the belt (or lack of one). There’s red spot on his left hip that looks like the edge of the belt, and you can see the outline of the belt extending between the red spot and the end of the red line on his abdomen. Is that part of the belt just covered in grime, or has it been airbrushed out of this early photo? I love the look of the suit — it looks modern while still retaining all the classic elements, and it’s different enough from Tobey Maguire’s suit (which was also awesome) to invite comparison and avoid confusion. Better yet are Garfield’s posture, expression, and pose — you can see the weight of the world on Peter’s shoulders. And that’s what always made me relate so well to Spider-Man, because we all know how it feels when our best intentions go wrong or our best efforts are still never enough. I could not have cared less (and didn’t) when a new Spider-Man was first announced because I was still so bitter about Spider-Man 3, but everything about this movie so far (which you can read here) has really warmed my heart and gotten me really, really excited. And … Chris Evans as Captain America!